Mercy Watson is a gem of a character for sure! 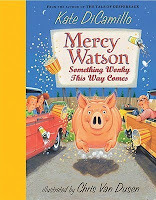 I believe that Kate DiCamillo is coming out with another series quite soon...more difficult than Mercy Watson. I heard it from a Candlewick Rep. :-) Can't wait to hear more about it! I can't believe you dropped that little bit of news about a new series without adding more details. I googled and googled, but to no avail!